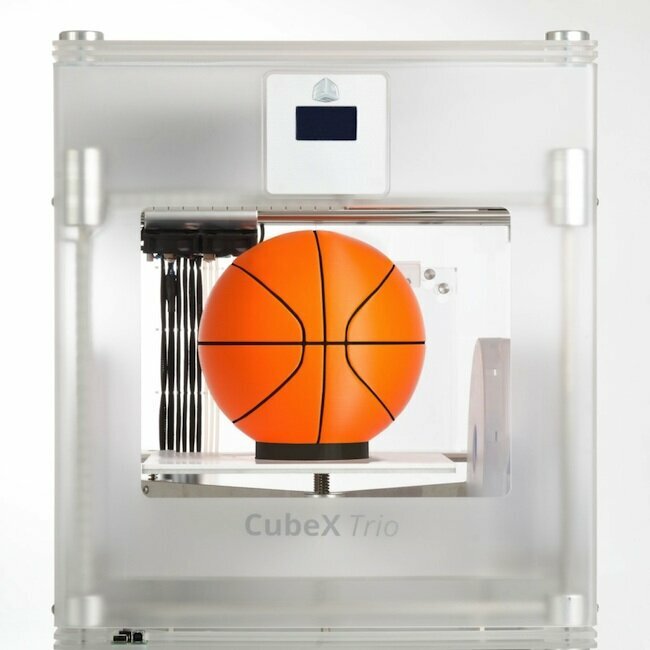 3D Systems releases the Basketball Printer!!! Kidding, obviously. But their new 3D printer will print a basketball size object. While you’ll find this new printer on 3D Systems’ Cubify.com website, it’s not a new model of the Cube (announced today too) — it’s such an improvement, such a Cube on steroids, that it’s a whole new line with a new name: the CubeX. The company calls the CubeX the “ultimate desktop 3D printer,” with the largest print volume in its class. But that’s not the big deal over the Cube, this baby will print in up to three colors, broadening its appeal beyond just hobbyists. The CubeX’s build area is a whopping 1030 cubic inches of space, with dimensions of 10.8″ x 10.45″ x 9.5″. That dwarfs the 11.2” x 6” x 6” build area of its main competitor, the Makerbot Replicator 2. While we’re comparing the two printers, the Replicator 2 still holds an advantage over the new CubeX in resolution. The Replicator 2 prints at a 100 micron resolution while the CubeX prints at 125 microns. CubeX calls this their “High Definition” resolution, but you can also set it to print at Crisp Definition (250 Micron) and Standard Definition (500 Micron). The CubeX comes in three models. All print in either PLA or ABS plastic, and the printer auto-detects which type of cartridge is installed. They come with free print software, a free copy of Cubify Invent software, three material cartridges and 25 free prints on the Cubify.com website. The least expensive model of the CubeX is $2,499 and will only print in one color at a time. Move up to the CubeX Duo at $3,249 and its two print heads will let you print two colors in one model. If you want three print heads for three color printing, you’ll need the CubeX Trio at $3,899. If you can’t decide if you really need two or three color printing, no need to stress about it now. Just buy the low-end CubeX and add a print head or two later. They’ve made the line easily upgradable. The upcoming two-color Replicator 2X, which will run $2,799, will offer two color printing as well. You’ll need to compare that to the $3249 CubeX, weighing the pluses and minuses of both. Like its little brother the new Cube, the CubeX print software will let you print solid, hollow or half-filled structures, offering better object strength control and less waste of material. And there now sixteen filament colors available, including glow-in-the-dark blue and green. In addition to glow-in-the-dark green material, the CubeX is also going green in terms of sustainability. Their “MoistureLock” material cartridge extends the shelf life, so there’s less likelihood of having to toss out old material. And they’ve set up a program where users can send back empty cartridges in exchange for a discount on new ones, and send back their used ABS and PLA prints for recycling or composting. And the CubeX uses a heatless print pad that delivers significant power conservation. It was a welcome surprise to see the new CubeX line, along with the second generation of the Cube. As other 3D printers have become more powerful at lower and lower prices, the first generation Cube didn’t have much appeal over its competition, other than it’s looks and ease of use. Today, 3D Systems has signaled that it is serious about making a play against Makerbot.